Unique and small place with an European flavor! This magnificent and charming victorian house was built in 1876 by the Ursulines Sisters to welcome the “Nobility” of Quebec. This warm wooden house is characterized by a charming decoration of fine mixture of contemporary and antique furniture. The stylish decoration of the hotel Marie-Rollet highlights the building Historic Cachet while having an elegant touch. The rooms of this small boutique hotel have an unique personality in the style of European hotels! A haven of peace and a warm hospitality. Marie Rollet is Louis Hébert’s wife, they are the first French family to established in North America in the Upper Town of Quebec City. They left Paris for New France in 1617. The crossing was so awful that passengers fear for their own lives as the conditions are execrable and because of the many Icebergs which were on their path. With their three children, they were the first ones to navigate the Atlantic Ocean to join the New World. Due to her strong personality Marie Rollet quickly becomes a reference person in the new colony and not just Louis Hébert’s wife. Her mission is to be in front with the political and religious leaders of the New France and with the Amerindians whom she strives to convert to Catholicism. She puts efforts to teach the “French” lifestyle to the Amerindians which means teach them to read, to write as well to sew and the hygiene of the European life. After Louis Hébert’s death in 1627, she decides to stay on her lands even if many colonists, in the coming of the English, decide to leave for France. 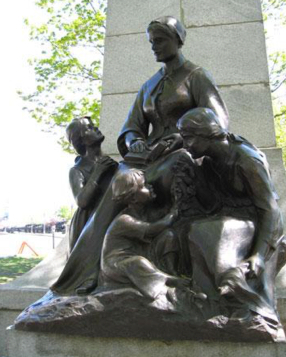 This heroine lady was the first teacher of the New France. She dies at 69 years old leaving us several of her descendants. The Hotel Marie-Rollet attracts many customers due to its location in the heart of Old Quebec. We are in the central point of the old fortified city (inside the walls). All activities, services and attractions are within walking distance.